Yes, here I go again with another period costume piece but this time it's not your usual drama but one with a sense of humor and the best kind of humor - the dark type. The backstabbing and manipulation in this contest to become Queen Anne's favorite looks like a bit of delicious fun. The Favourite starring Olivia Colman, Rachel Weisz and Emma Stone will open in theaters on November 23rd. I feel these are the most important words in the Rocketman sneak peek. The life of the irrepressible Elton John would suffer in a straightforward biopic and this quirky, fantasy style suites me just right. Rocketman starring Aaron Egerton, Jamie Bell, Bryce Dallas Howard and Richard Madden will blast into theaters May 2019. Remakes elicit groans, yawns, moans and sometimes outright hostility these days, although I will point out we still line up to see them. Bradley Cooper and Lady Gaga star in this fourth iteration of the timeless story of fame and its consequences. I won't bury the lead here in that the buzz has been huge since the very well made trailer hit the big screen, the early reviews are pretty much over flowing with positive vibes and my audience reaction last night predicts only the best. Jackson Maine (Bradley Cooper), a slightly faded but still popular country/rock (genre kept a bit vague) singer, has just finished a concert and is drinking with the full intention to do some more. His driver drops him off at the only open bar they find and he stumbles into a modern version of "meet cute' that is intended to quickly hook the audience. It's a gay bar with plenty of fans who recognize him and a drag show in full progress. Ally (Lady Gaga) takes the stage to perform, non lip syncing, and instantly catches his attention. What follows is one of those epic nights that we hope exists in real life. There's some not to miss fun with the drag queens, an almost bar fight and lots of talking about the power of music. Ally realizes she's being pulled into the orbit of a man who oozes a rough sort of charm and Jack finds himself in the presence of something he doesn't find very often - a truly talented singer and song writer. Before she can take a deep breath, Alley is whisked away from real life with a romance that skips budding and goes full intensity, a viral YouTube video of her singing live on stage with Jack and the interest of the wider music industry. As this story tends to go, the love story grows and she rises to stardom, all the while with Jack's drinking and escapism deepening. The good, bad ugly of this situation simmers with the forgone conclusion that it will all come crashing down at some point. I described the first meeting of Jack and Alley earlier as a "hook" and it does its job well. 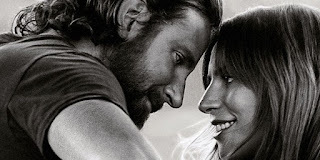 Bradley Cooper and Lady Gaga have such intense chemistry on the screen that the audience could not help but ooh ahh and laugh in all the right places. All of this works to let you fall for the instant attraction and love story that you will need to enjoy the rest of the movie. I think the only lag in the story for me is when Alley begins to adopt a more "pop" attitude for her music. It's partially the fault of a label that she signs with but some parts are overly cringe worthy. There is a Saturday Night Live performance that had me guessing if it was intended to be as cheesy as I found it. Thankfully the loss of momentum doesn't stall the overall story. The music? Well if you've seen the previews, trailers and promotional scenes, you'll already realize the strength of both the veteran and newcomer performances. So yeah, go see this movie and appreciate it on the big screen. It's an A+ effort. One last thing. If you see it with anyone who says, "Oh wow Lady Gaga has such a wonderful voice", feel free to give them your most non judgmental eye roll and say, "Keep up. That's so 2013". Back from a brief hiatus, I'm here to talk about the teaser trailer for If Beale Street Could Talk, directed by Barry Jenkins who is best known for the celebrated and infamous (ouch! that Oscars mix up) movie Moonlight. Light on plot details but heavy with atmosphere, I found this to be an excellently made trailer. Noticing how quiet the theater had gone, I looked around quickly to realize that everyone had their eyes locked on the screen. I think, like me, they were drawn in by the intense scenes of direct eye contact with the characters. After it was over, I wanted to stand up and say "Excuse me everybody but can we give Regina King an award of some sort right now?". If Beale Street Could Talk based on the novel by James Baldwin and starring Kiki Layne, Stephen James, Regina King and Teyonah Parris will open on November 30th. DC continues its extended universe of movies, rolling out two new trailers recently including this one for a definite light-hearted and whimsical take on the character of Shazam. It follows the story of teen orphan Billy Batson who gains amazing super powers after an encounter with the ancient wizard Shazam. He transforms into an adult version of himself and can use his powers by bringing down the lightning and uttering the words "Shazam!". It's worth noting that the character was originally called Captain Marvel but some legal wrangling solved that conflict and as we all know, Marvel movies have grand future plans for their Captain Marvel character. I'm really feeling this except for the costume. My reaction was immediate and negative with flashbacks to The Greatest American Hero from the 80's. I promise I do not suffer from DC Derangement Syndrome and (how shall I put it) am not Mystified by All Things Marvel. It was my honest first reaction. I'm not a nitpicking buzz-kill that would let something like that ruin a fun movie though; so we shall see how this works out as we discover more about Shazam!. Shazam! starring Zachary Levu, Jack Dylan Grazer and Asher Angel will strike theaters in April 2019.